Could digital revitalise magazine ad sales? THE launch of Apple’s latest iPhone, iPad and Mini iPad has opened up more opportunities for digital publishers. With faster processing speeds and retina display these devices have the potential to offer magazine readers a richer user experience – if the publisher gets the content right. But what impact will it have on magazine adverts and does it have the potential to increase revenue through digital ads? While for many magazine publishers digital edition sales are at best disappointing and at worst dismal, developments technology could see these increase as the user experience becomes richer and more convenient. In turn increased circulation is likely to more attract advertisers as digital products offer the potential for innovation and the opportunity to deliver a multi-faceted adverts. So how can publishers persuade their advertisers to spend more on digital in addition to print advertising and social media sponsorship? Firstly the product (magazine) has to have a perceived value to the reader in terms of content – be it information or entertainment. Magazines that achieve this are delivering strong newsstand sales on a regular basis. This translates as sustainability to potential advertisers. 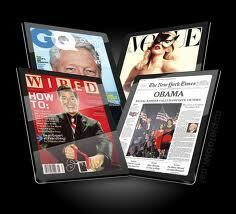 Also ensuring that your advertisers’ brand values are aligned to the magazine will also help. For example adverts for Iceland are unlikely to get much response in high-end women’s lifestyle publications such as Marie Claire, Instyle and Red. Whereas Ocado.com is more likely to attract good rate of response in such titles. Specialist and niche magazines are also likely to benefit. An advertiser wanting to advise courses in a writing magazine would, in the digital edition, be able to offer a link to a taster course. This not only benefits the advertiser but also the publisher as it further enhances the user’s experience. This entry was posted in Revenue streams and tagged advertisers, digital edition, digital publishers, magazine publishers digital edition, magazine readers. Bookmark the permalink.